In the law, cases are “on point” when the facts of the case in the law books – already decided – exactly match the facts in your case so you can cite it as being the law. So it follows that it kind of annoys me when folks use the phrase “case in point”… where does that come from? It’s like “tough road to hoe” instead of “tough row to hoe”. But then I get persnickety about silly stuff like that. You’re shocked, I know. But I digress – another big shock. This is a Tip Jar post and it’s about those pointy things we use every time we stitch – needles. Are you changing your sewing machine needles regularly? You know you should, right? Whew. But here’s the problem – what is regularly? And how do you remember when you changed it the last time? I happily confess to thinking that you only changed sewing machine needles when they broke – usually by sewing over a pin or something silly like that. When the sewing machine folks started saying they should be changed regularly, I thought it was a collaborative conspiracy – legal term: collusion – with the sewing machine needle manufacturers to get us to buy more needles. Since I was still young and impressionable, I bowed to their pressure and – this pains me greatly – discovered that I could tell the difference. I really don’t like when “the man” is right. The reasoning is simple – that needle is traveling very fast and it is piercing fabric every one of the couple hundred times it passes through the fabric in a minute. (If you have a Juki, it’s a thousand times per minute.) It stands to reason that the constant hitting of the fabric will slowly dull the tip of the needle. But how often should you change it? Every four hours? Every eight? And even if there were a definitive, conclusive answer, how do I remember when that was? I change my needle every five bobbins. It’s nothing more than a mile-marker. Side note – while those bobbin-buddies are cute, they also serve a really good purpose beyond keeping the thread from un-winding. If you keep your extra wound bobbins on the top of your machine – which I sometimes do when I’m at a retreat – the thread from the bobbin can get caught up with the thread spool winding into the machine. It doesn’t happen often but it’s a mess when it does, and I’m told that it can do harm to your machine. When I’m winding my new bobbins and changing the needle, I also clean and oil my sewing machine. Yes, I do that every single time. Unless I have just a little bit more to finish the pieces, blocks, borders I need to finish before shutting it all down for the night… just saying. Changing the needle and machine maintenance are about achieving the same goal – prolonging the life of your machine. The harder it has to work, the sooner it will wear out. All of our machines are different and many newer machines don’t require regular oiling. If your machine doesn’t require that, I recommend that you find some kind of mile-marker to let you know when it’s time to change the needle. A friend whose machine doesn’t need to be oiled regularly buys pre-wound bobbins and puts them in one of those donut-rounds – called a BobbinSaver – for bobbins. Every sixth bobbin is empty to remind her that it’s time to change the needle and blow out the lint in her machine. By the way… blowing the lint out. Can we take a moment and talk about canned air? The sewing machine repair folks will tell you it’s a bad, horrible, potentially disastrous idea. I get that – really. If I opened up my machine and didn’t take the time to brush out that big clump of lint, I can see that some might get blown into a crevice instead of out. Got it. 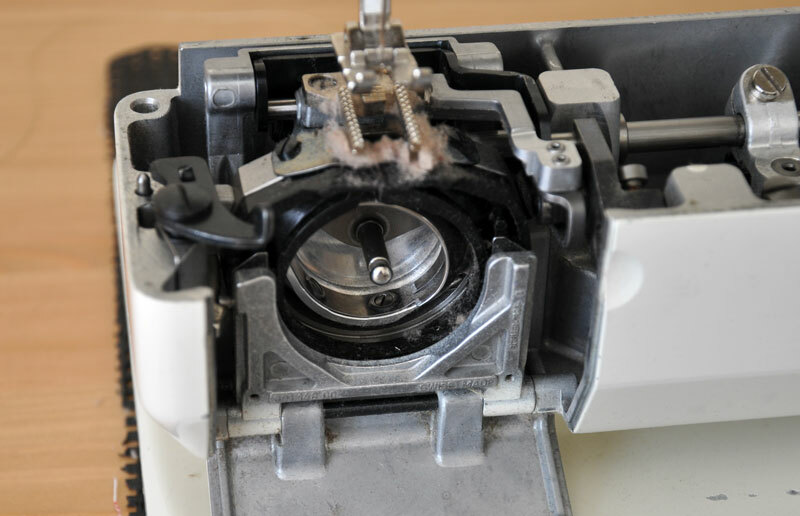 But this I know for sure… I have been using canned air to clean my Bernina for more than 20 years – ever since you could start buying the canned air at camera shops. Do I recommend it? No. Do I do it anyway? Yes. And that’s it for today. This message has been brought to you by the fine people at Schmetz Needles. I’m kidding! I still there’s some kind of conspiracy at work… it’s the only reason for making the eyes smaller. You know they’ve made them smaller, right? This is a great post. I have one of those machines that don’t require oiling and it freaks me out just a bit not to do it. But I’ve had the machine 8 years now and going strong. I like your idea of using bobbins for timing the maintenance and changing the needle. I also use a Sharpie to mark needles that get changed out after a short use (like if I need it for garment sewing). This lets me know the needle has already had some “treadle time”. After 3 marks, I don’t reuse them. Love this post. Always helps to have guidelines. I have a Brother Innovi’s 2500D, I have always cleaned my machine after the 4th bobbin, I also changed my needle. Clean around the bobbin area. I have had my machine since the fall of 2009. I am still afraid to use the canned air. I am on a fixed income, if something happened to my machine, I couldnt afford a new one. I used pipe cleaners, q-tips, to get into those tiny areas, plus the brush that came with the machine. I love your bobbin buddies, I use those little pony tail thingies for my bobbins and thread. Nah… it’s not your eyes… cuz if it’s your eyes – then it’s my eyes too! Haha! I prewind 3 bobbins & when it’s time to rewind, I clean out the bobbin area. But I never thought of changing the needle so fast as 5 bobbins! Really? Needles really are inexpensive- Let’s Do It! The other “thing” is the rotary cutter blade. Why oh why do we wait so long to change the blade ?? New blades that cut like a hot knife through butter are SEW nice! It’s dull blades and pushing on them so hard that ruins the mat! I am bad about changing needles both for hand work and sewing machine. I don’t know why just am. I will try your bobbin idea and see if I can remember to do that!! I do clean the machine often so I should be able to change the needle too — love your post today!! Great post, thanks. Need to remember the cleaning of my machine! Carrie, thank you for another informative (and humorous!) post. I love your ideas and I’m going to try them. I’ve never seen the bobbin thingies before – I will have to look for them! Great informative posting as usual. Thank you Carrie. Wishing all who read this a great week. I have my Grandma’s Bernina 830–I have had it for 20 years and it is almost 43 years old. She bought it at the fair the same month I was born. I clean it out with canned air too and love how easy it is to take apart to clean. I retired it several years ago and got a Pfaff because I could not afford a new Bernina–it is much more difficult to take apart and clean, so I don’t do it as often. Thanks for the tips! As always … a great post! THANK YOU!! I like to oil my machine regularly, too. I think it’s a crime the “new” sewing machine manuals discourage owners from oiling them. moving parts need oil. I’m curious – how did you get the throat plate off? I remove the plate at the feed dogs, but how did you remove the larger plate? I’m curious about that too! On my old Berninas – the 830 and the 930 – there is a little lever on the inside, on the left side right under the large plate. It’s in the front corner. Yes, they hid it. It releases that side of the plate and then it can be pulled out – there are two prongs on the right side that are slid into place before the left side is “locked down”. Not use canned air I thought as I watched my repairman blow out the bobbin and top area with the canned air BEFORE he took anything else off! I guess it’s just false economy to try to stretch needles and rotary cutters for one more project. I have my mothers and my MILs featherweights. I use my mother’s regularly, my MIL’s not quite as much. 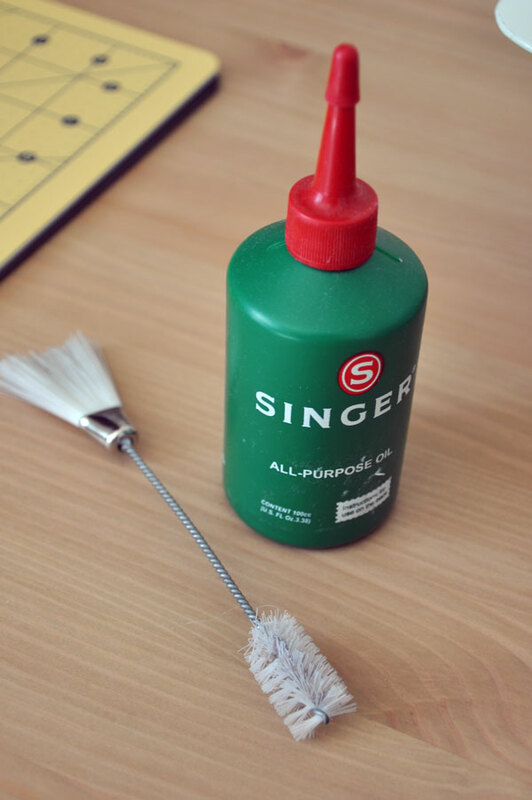 The Singer needles they used are still in the carrying cases. I don’t know if my MIL ever changed her needle and I have been afraid to use anything but Singer and they are hard to find. This year I finally put in Schmetz needles and they are working just fine. Honestly, hangups will be the death of me. Thanks for your tips, I really appreciate them. I didn’t realize that changing the needle that often would make a difference. I changed less frequently-time to start anew! I hear ya, but I have to admit, i don;t change my needle as often as I probably should, But on the brighter side, I clean and oil it regularly… I am out of canned air at the moment but do brush out the lint before i spray it with canned air. And I still love this stuff, no matter what my Bernina dealer says, as i know she uses it as well, I have witnessed this when in her shop and she is cleaning a machine… I will try to do better on the needle changing , just because you said so! LOL Happy Monday to ya! Carrie I like and agree with your post, especially about the cleaning but I usually use Superior titanium needles so they stay sharp much longer. What I really am contacting you about is your cutting instructions for your cracked pots quilt. I started to cut it out probably in 2007 and had a hard time understanding the instructions so I put it away. I have just ottos it out and want to make that quilt but am still having a hard time understanding the instructions. Was there ever a revised set of instructions made? Right, I just change my needle when it’s breaking or gets reaaallly dull. After 5 bobbins sounds like a good idea. I have some of those pink bobbin buddies but they “crimped” the thread on my bobbin. I had some of those terry cloth pony tail holders that are poplar for bobbins now so I use them now. I had some nice bobbin holders that stuck inside a spool but they don’t fit Aurifil spools so now I prewind about 8 bobbins of my often used colors and store the bobbins with the spool of thread inside a small ziploc baggie. 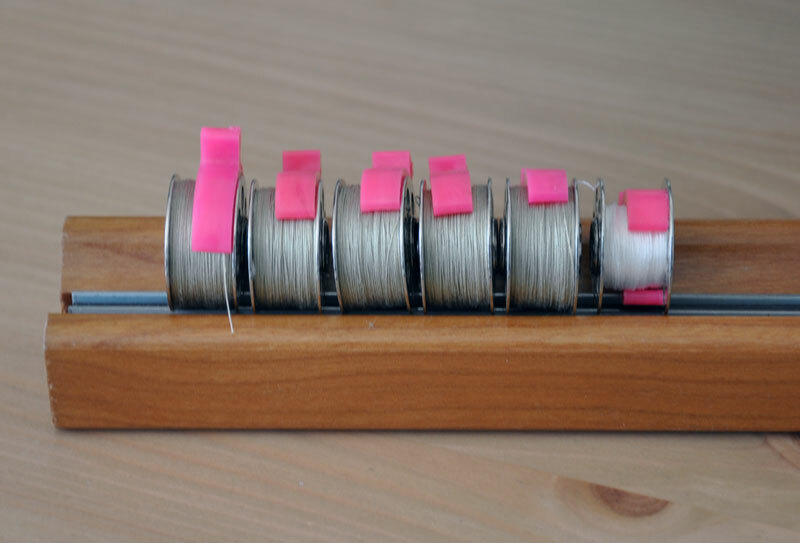 That way I know what bobbins go with which thread and the ponytail holder keeps it from becoming a tangled mess. .
Great post! I’m amazed at how many of my friends don’t change their needles regularly and am in utmost shock that they don’t regularly dust out their machines! It only takes a few minutes and my Bernina purrs with contentment! I do oil my machine (Pfaff 7550) after 5 bobbins also. I clean the lint after the bobbin runs out and before I put a full one in. As far as the needle..bad as charged. Maybe once a month if I think of it. And canned air…my service guy uses it and told me it was OK so I have been using for a long time and I don’t see a problem really. Great tip on timing my needle changes. I have found needles that are wonderful. 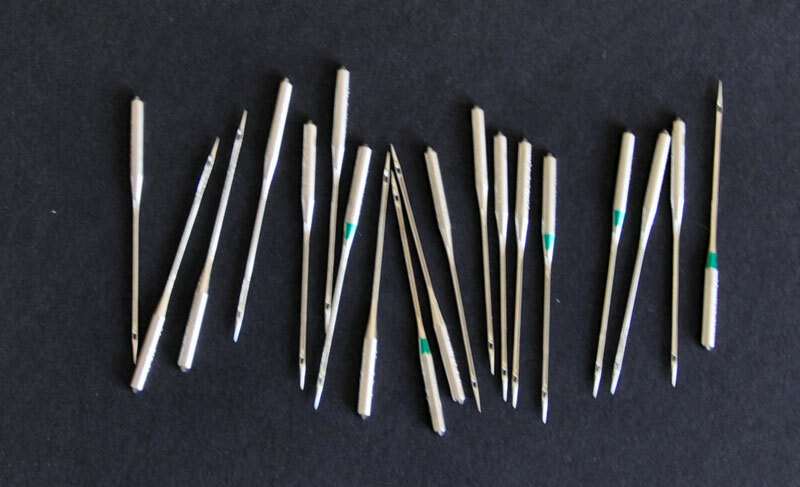 They are top stitch needles sold by Superior Threads. They have a very sharp point and a large eye that keeps embroidery thread from shredding. I confess that I haven’t been changing my needles as often as I should, but will try this advice. Great blog. Ashamed to be so dense, but after 5 bobbins—after you fill 5 bobbins, empty 5 bobbins, change the bobbin 5 times? What about titanium needles? Aren’t they supposed to last longer? I sew a lot, mostly on weekends. I always start out every Saturday morning with a new needle. I defuzz my bobbin area with a lambswool brush, and finish up the nooks and crannies with either a cotton swab or a little dental brush — the ones by GUM are called Go Between Proxabrushes. You know those little rubber handled brushes they make for cleaning the broccoli out of your kids’ braces?? They grab the lint balls right out of corners. And yes, those danged needle eyes get smaller every year!